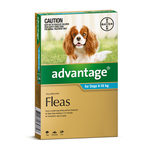 Fleas aren’t just annoying for your dog, they can cause serious skin irritation and allergies, spread parasites and heavy infestations can even result in anaemia from blood loss. 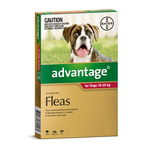 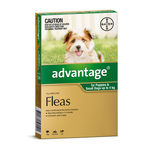 Advantage offers your dog fast relief from fleas, stopping them from biting within 3 to 5 minutes after application plus it continues to kill adult fleas, larvae and eggs for a whole month. 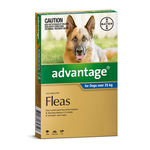 Advantage is water fast after application and safe to use in dogs and of any age.